Intending to build this model in Replica Stock fashion, Ron replaced the stock front end and most of the missing pieces with resin replacement parts from The Modelhaus. Rather than use the original kit's dated chassis, Ron sourced the chassis and suspension from a modern AMT 1969 GTX Convertible kit. 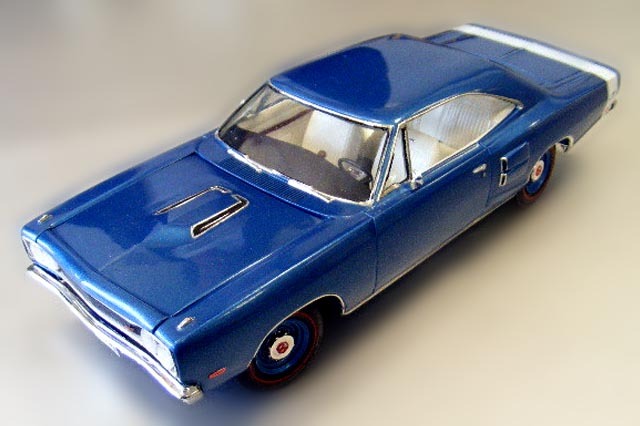 Polyglas tires (to which Ron added red lines with a bow compass), a set of Chrysler "steelies" from a Jo-Han kit, and a set of correct 1969 Dodge "dog-dish" hubcaps from a Lindberg 1964 Dodge 330 2-Door Sedan.